The East End represents again in the Elby Awards! Our local favorites keep shining! 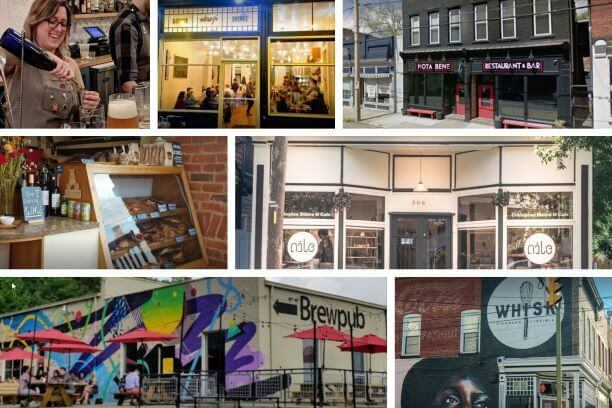 The Nile, Nota Bene, Sub Rosa, Alewife and Triple Crossing Brewing and Whisk are all 2019 Elbys awards nominees, Richmond Magazine’s annual recognition of “excellence in the Richmond region’s restaurant community”. The Eighth Annual Elby Awards will recognize a winner from every category, each with four nominees, all chosen by more than 40 industry professionals, Richmond region food writers, culinary instructors and food society members. (A tie in nominations resulted in five nominees within a given category.) Elby winners will be selected by judges who were not involved with the nomination process and are from outside the Richmond region. Alewife has been nominated for “New Restaurant of the Year”, along with Little Nickel, Longoven and Perch. Bobo Catoe Jr. (Alewife) and Laine Myers (Nota Bene) are also up for “Chef of the Year”, as are Mike Ashley (Brenner Pass), Brandon MacConnell (Shagbark), Thomas Owens (Saison) and Craig Perkinson (Southbound). Continuing to represent Alewife is Katy Best for “Bartender or Bar Manager of the Year”. We featured Katy as one of our People of Church Hill a couple of months ago on Instagram! The Nile has been nominated for “Best Global Cuisine” alongside Abuelita’s. Carena’s Jamaican Grille, Lehja, Pho Tay Do and Temple. Sub Rosa Bakery and Whisk are also representing the East End under the “Best Bakery” category along with Idle Hands Bakery and Red Cap Patisserie. The evening’s theme will be “Reading the Future of Food,” with heavy emphasis on the future. The evening’s goal is to highlight the breadth of the Richmond region’s food community, celebrate the people who elevate it, and recognize those who go above and beyond for the larger community. The Elby Awards will be held Sunday, April 28, 2019, at Hardywood West Creek. Tickets will go on sale March 22. I love Sub Rosa Bakery!